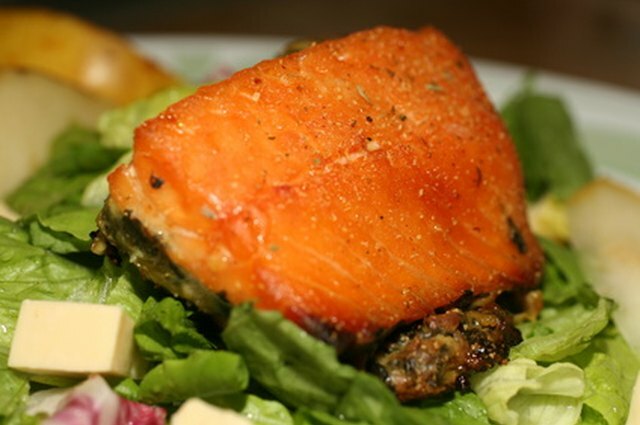 Salmon offers significant levels of several important nutrients. Half a fillet (or just more than 6 oz.) 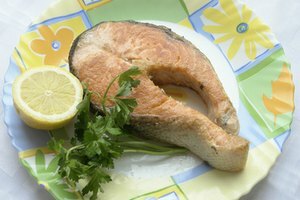 of farmed Atlantic salmon cooked with dry heat offers at least half of your daily requirements for selenium, vitamin B12, niacin and vitamin B6 as well as more than a quarter of your daily requirements for phosphorus, thiamin and panthothenic acid, according to SELFNutritionData. 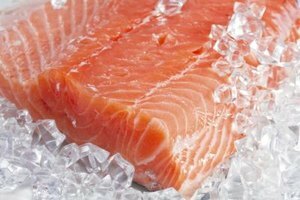 Cooking frozen salmon in the microwave is possible, but doing so incorrectly can result in fish that is frozen inside but fully cooked on the outside. Remove the salmon from the freezer and from any packaging. Place the salmon on a microwave-safe plate and microwave on “Defrost” setting (or 30 percent power) for one to two minutes. Check the salmon to see if it feels warm. If so, allow it to stand until it cools then return it to the microwave for another 1 to 2 minutes on “Defrost.” If not, immediately microwave it for another one to two minutes on “Defrost.” Repeat this process until the salmon is fully defrosted. This will probably take six to eight minutes per pound of fish. Season the salmon with salt and pepper to taste, then add 2 tbsp. 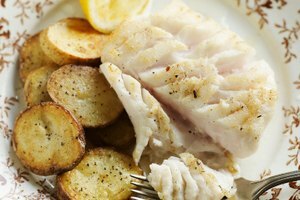 of water to the plate, taking care not to wash the seasonings off the fish. Cover the plate of salmon with a layer of microwave-safe plastic wrap. Leave the wrap slightly loose or puncture several times to allow excess steam to escape. Microwave the salmon on “High” for three to six minutes depending on its size and thickness. 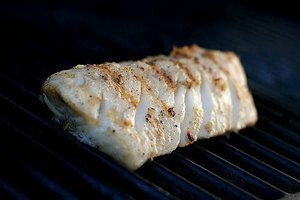 If you are not sure of the best time for your fish, start at three minutes. Check the fish at the end of this time to see if it is done. Fully cooked salmon will be opaque and flaky. If the salmon is not done, cook it for another minute and check it again. Repeat this process until the salmon is perfectly cooked. Rotate the position of the salmon on the plate each time you check it. This will help to ensure it cooks evenly. Add other flavors or seasonings to the salmon at the same time as the salt and pepper, if you wish. You could include a squirt of lemon juice, a dash of smoked paprika, a pinch of chili flakes or a sprig of fresh herbs, for example.